Ford Performance has teamed up with the watch experts at B.R.M to create the stylish new Bullitt 50 Chronograph, a 1 of 1 timepiece that contains a real flake of paint from the original Bullitt Mustang. 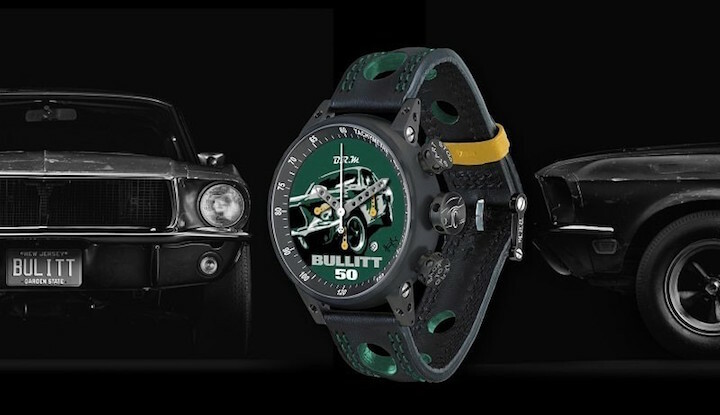 The Bullitt 50 Chronograph was released to commemorate the arrival of the new Mustang Bullitt, along with the 50th anniversary of the release of the iconic film of the same name. It features a matte black casing with a Bullitt graphic face and a green and black leather strap. More importantly, though, is it will also contain a 1 gram paint fragment from the genuine Bullitt Mustang. For this reason, just one of these watches will be made. You can’t just buy this Bullitt 50 Chronograph, then. To get your hands on it, you’ll have to purchase one (or a handful) of the 1,968 raffle tickets available for the upcoming draw for the watch. All proceeds from the sale of the raffle tickets will go to charity. The winner of the raffle will be announced by Bullitt movie car owner Sean Kiernan at the Grand National Roadster Show in California later this month. The raffle, handled in partnership with Drive Toward a Cure, will benefit the Michael J. Fox Foundation for Parkinson’s Disease. The donation will be made in memory of Sean Kiernan’s father, who had owned the Bullitt Mustang since 1974. The Drive Toward a Cure raffle was also set up in cooperation with Warner Bros. Studios and Steve McQueen’s son Chad McQueen. Check out the video embedded above to see Sean Kiernan removing the paint fragment from he original Bullitt movie car for use in the Bullitt 50 Chronograph. You can also visit drivetowardacure.org for more info on how you can buy raffle tickets to win the watch. You might not be able to buy the original Mustang Bullitt, but this raffle could allow you to own a small piece of it, at least.